I love quiche, but am not such a fan of the really fancy ones (you know the ones with artichoke hearts, asparagus and marinated eggplant etc…). I just like homestyle ingredients in my quiche, which is good I suppose, because it keeps the cost down. 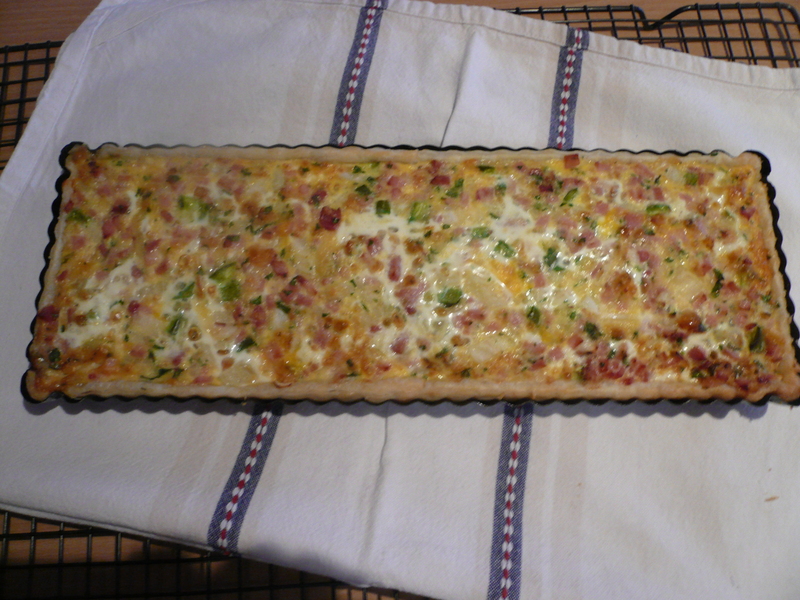 When I make the following quiche for my family, it gets totally demolished. This recipe is easy to do in large quantities using rectangular pie tins (see discussion in Serving Up) and makes 5 dinner sized portions. Total cost less than $6. 1. Get pastry out of freezer to thaw on the bench while you make the quiche filling. Preheat oven to 180 degrees. 2. Combine diced onion, bacon, capsicum, grated cheese and parsley in a medium sized mixing bowl. 3. In another smaller bowl, lightly beat the eggs, add milk and mix. 4. Grease the inside of the tart tin (I use olive oil or canola spray) and fit the pastry into the tin tightly, making sure all the pastry joins up. 5. Fill the tart tin evenly with the filling mixture and then pour egg and milk mixture gently over the top. Season with salt and pepper. 6. Cook in the oven at 180 degrees for 25 mins (though I would start checking earlier). I added pizza sauce on the base and I only had 3 eggs and it turned into a yummy pizza-quiche!